Chroma Cube is a creative game for kids that is as fun to play with as it is nice to look at. 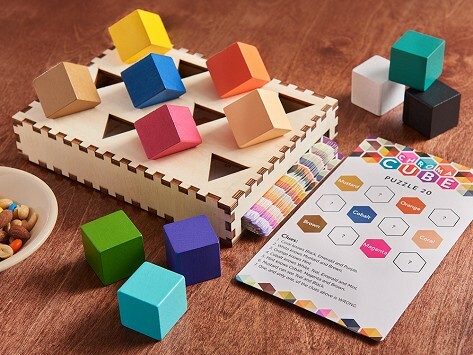 In this wooden puzzle-game hybrid, kids try to solve the color-arranging clues on the game cards. When they’re done puzzling the colorful wooden blocks out (while honing reasoning and logic skills), parents won’t mind keeping the game out on the coffee table. They like being baffled and continue to be interested long after the holiday. My 9 year old niece loved this game when i gave it to her for Christmas! So fun! Is replacing Solitaire for me. This is a great game! It’s harder than you think and kept several adults busy for an hour working on progressively more difficult designs. Kids follow the clues in the card pack and try to arrange the cubes accordingly. Stumped? The solution is on the back of each card. When little ones are done playing, Chroma Cube is an artful addition to a coffee table or bookshelf.